Sweet Potatos and Peanut butter are two of my favourite things to eat but I never thought I’d see the day when I’d be able to eat them both together. 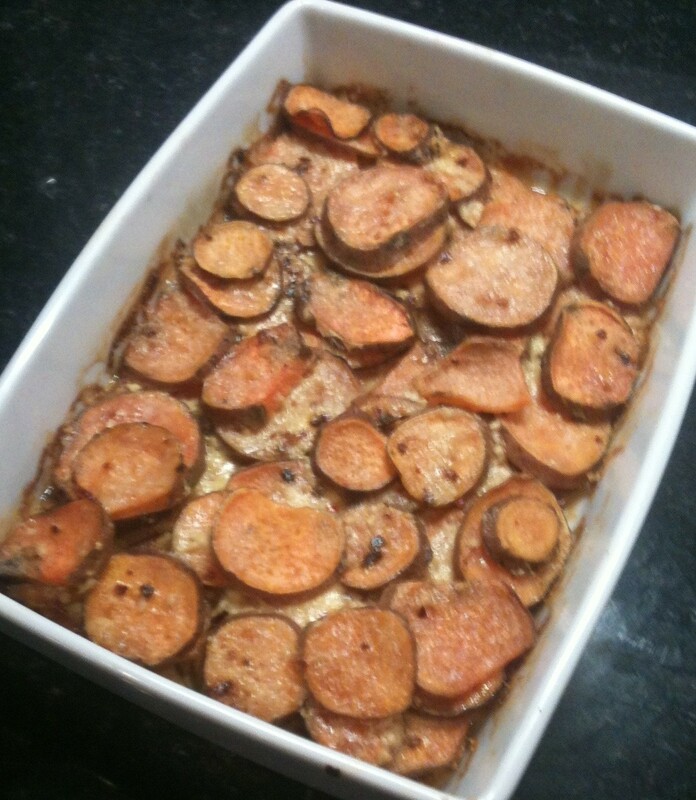 This recipe for a Sweet Potato and Peanut Butter Gratin made that dream a reality. Sweet Potato’s are good for you in all kinds of ways and they’re a cheap and easily obtainable alternative to starchy white potato’s. If you’re a fan of Sweet Potato’s click here for a simple salad recipe and here for a Gluten Free Hash recipe. The Lime, Garlic and Chilli added to the Sweet Potato’s here cuts through their sweetness a little bit and the addition of Peanut Butter brings a Satay vibe to the dish but without the need to use or find a replacement for glutinous soy sauce. If you don’t like peanut butter just leave it out, the recipe works just as well as a straight forward sweet potato Gratin. This gratin works well as a side dish, I like it with Chilli or a chicken breast and green beans. It’s equally good as a main dish served with a green salad, this is a good option if you find it too sweet as the bitter salad leaves balance the sweetness of the gratin. 150g peanut butter (I find a crunchy, sugar free variety best). Heat the oven to 190C and lightly oil a large oven proof dish. Cut the sweet potato’s (peeled if you prefer, I usually don’t bother) into thin slices. In a large bowl, mix the sweet potato slices together with a tablespoon of oil, the chilli, garlic, cream and some salt and pepper until they are all equally covered. Arrange half the sweet potato slices in the oven proof dish, spreading them out with your fingers until they form a rough, flat cover of the bottom of the dish. Mix the peanut butter with the lime juice and a tablespoon of oil. Pour the mixture over the sweet potato in the dish and then spread it flat. Cover it with another layer of sweet potato and then cover the whole thing with any of cream, garlic and chilli mixture remaining. Cover the dish with foil and bake it for about 20 minutes, then take off the foil and bake it for another 30 minutes. 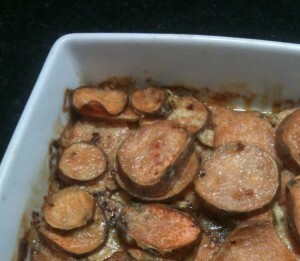 It’s done when the sweet potato is completely tender and the top is browned and beginning to crisp. If you’d like it a little crispier put it under a hot grill for 2 or 3 minutes but keep an eye on it as it can easily burn. Article posted in Dinner, Recipes on October 12, 2013 by Ray Smith.